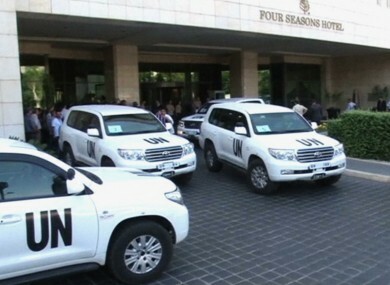 UN vehicles at a hotel after UN weapons inspectors arrive in Damascus. THE UN SAID its experts will on Monday launch a probe into the alleged use of chemical weapons near Damascus, where the opposition claims up to 1,300 people were killed in an attack last week. The UN announcement came shortly after Damascus gave the green light to the inspectors earlier today, saying it had struck a deal during a visit of the global body’s high representative for disarmament, Angela Kane. Secretary General Ban Ki-moon “has instructed the mission … to focus its attention on ascertaining the facts of the 21 August incident as its highest priority,” the United Nations said in a statement. The mission, currently in the Syrian capital, had been repeatedly delayed amid differences with President Bashar al-Assad’s regime over the scope of the probe into the alleged use of chemical arms in the 29-month civil war. The UN team, led by Swede Ake Sellstrom, arrived in Damascus last week. UN officials originally said their visit would last two weeks and cover three sites. The opposition claimed regime forces unleashed chemicals east and southwest of Damascus causing more than 1,300 deaths. The Syria government has denied the charges and in turn accused the rebels of using chemical arms. Doctors Without Borders has said 355 people died last week of “neurotoxic” symptoms. Syria has “affirmed that it will provide the necessary cooperation, including the observance of the cessation of hostilities at the locations related to the incident,” the UN statement said. The Secretary-General would like to reiterate that all relevant parties equally share the responsibility of cooperating in urgently generating a safe environment for the mission to do its job efficiently and providing all necessary information. Email “UN experts to investigate whether chemical weapons were used in Syria”. Feedback on “UN experts to investigate whether chemical weapons were used in Syria”.